The blog posts haven’t been that regular of late since I’ve been working on the home brew which is going pretty well. It’s mainly been the OH getting all the details right and doing the precision work so I’ve been more of a ‘creative guide.’ Seriously, if you want to understand beer, get brewing. Don’t think you need a massive shed or garage to have a go. We live in a flat so we’ve been doing small batches using the BIAB method which means we’ve been able to mash our own grain; the incredible aromas mean this is my favorite part. I’ll do a proper post soon about our adventures. All this experimentation is thirsty work and sometimes you need something classic. 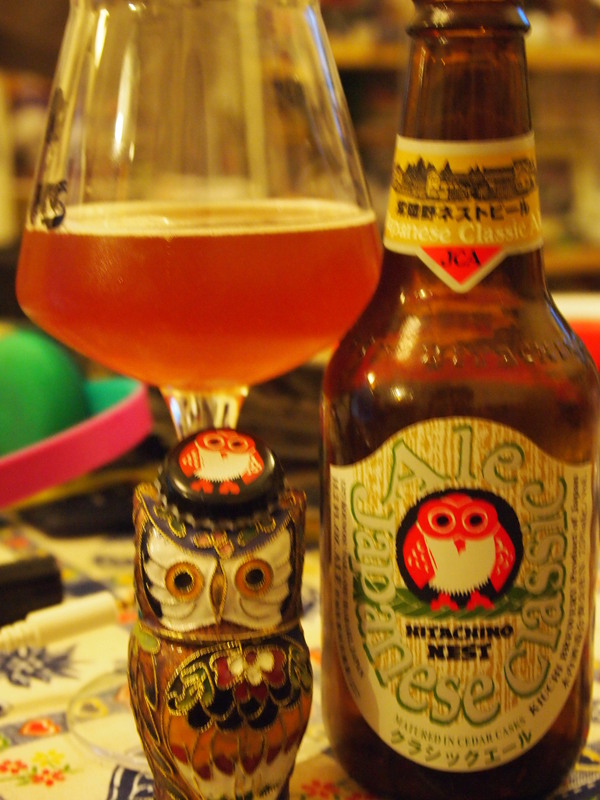 Kiuchi Brewery Hitachino Nest Japanese Classic Ale (JCA) (7.5%ABV) is a ‘Recreation of the first Japanese beer made in the Edo period…Aged in cedar barrels like the old IPA style method from England.’ I love this brewery just for their super-cute owl mascot but I’m pleased to say everything I’ve hd from them so far has been impressive. This one is a really gorgeous hazy sunset colour with the scent of apples and wood and a tang of lime, playing alongside honey and plump juicy fruits. Despite the downpours of our Great British Summer, I can imagine the warm sun rays as I enjoy the sweet, fruity orchard fruit flavour with a warm alcoholic fruit liquor taste at the back. The juicy, full flavour becomes dry at the end with a little citrus on the tongue. I can’t wait to try more from this charming range – which one should I try next…? The coffee stout is interesting – love the owl! I can also recommend Baird’s if you can get any – not very japanese soudning but they’re based in Numazu. Their Red Rose Amber ale is lovely. Not sure what it is yet but there is something distincitive in the Japanese beers I’ve tried. Will look out for Bairds! Good tip since I’ve not actually heard of them.